Grande Copper Hopper Bird Feeder for Mom! A most awesome Mother’s Day gift, it hangs, it post-mounts, it holds 10 lbs. of seed… or even 20 lbs. for the serious backyard birder! Clean it with a forceful spray from the garden hose, it won’t hurt these large capacity hopper bird feeders. She’ll use this gift everyday, even if just a glance out the window at her busiest or most hectic times. A glimpse of nature in action has the uncanny ability to soothe the soul and calm the nerves… bird folks know this truth to be self-evident! The hoppers are vinyl (like the siding on houses) so they really do last a lifetime, no cracking, fading, peeling or mildew. Handcrafted in the USA, and bird-approved, they’re easy to fill and clean via lift-off roof and/or pop-out finial. Generous seed ports on 4 sides allow for chunkier seed mixes which may contain peanuts (yum) and lots of perching space to accommodate several takers at once. Expect chickadees, cardinals, titmice, nuthatches and all the usual suspects for dining in high style. The post-mounted hoppers include decorative brackets (also done in vinyl/PVC) that slide on a standard 4×4 post. Shiny copper roofs remain that way for a minimum of 3-4 years before they start to weather and become dark. Aged patina roofs (shown above) are created using an acid wash with heat process and remain this way indefinitely. To clean environmental build-up, a soft soapy cloth and garden hose do the trick nicely. But ya can’t wait till the last minute as each one is made to order! We’re getting them out the door within 1-2 days to make lots of Moms really happy next Sunday, but remember all the moms and all the packages being sent next week. Shipping services become inundated and standard delivery times may fall short of what’s promised. 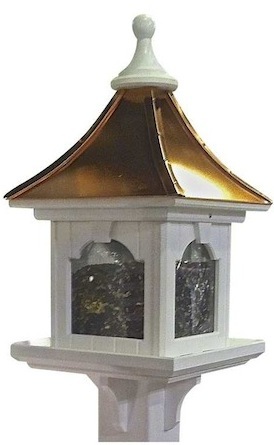 So shake a tail feather and make this Mother’s Day extremely special with a hopper bird feeder that guaranteed for life, she’ll never, ever paint, repair or replace this one! It’s a stately piece, substantial in size and stunning in detail that adds some impressive curb appeal while attracting feathered friends. Birds bring gardens to life and fresh water along with food sources bring birds! Our newest Copper and PVC bird feeder actually looks like wood (similar to all styles) but the real beauty lies in their long-term durability. They’ll withstand the harshest elements without peeling, cracking or rotting as wooden feeders are known to do over time. Squirrels are far less likely to chew on PVC, have you ever really seen one gnawing on vinyl siding of a house? It’s extremely rare, but should they try and shimmy on up the post, there’s an unobtrusive white post-mount baffle to stop them dead in their tracks! 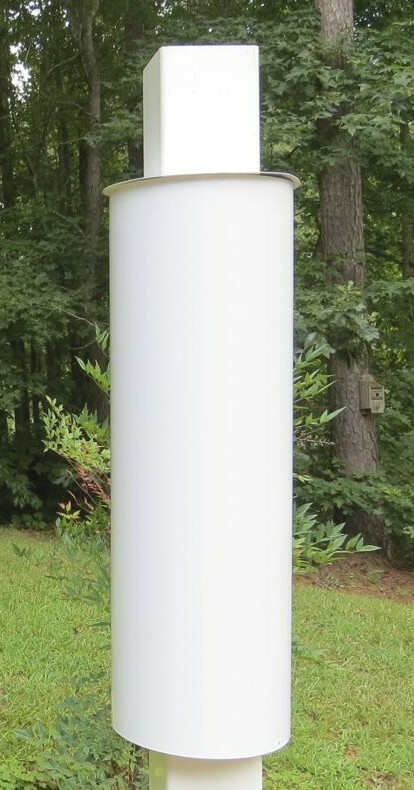 With a large 5-inch acrylic feeder tube that’s sheltered from elements, birds will delight in dining here season after season and for many years to come! 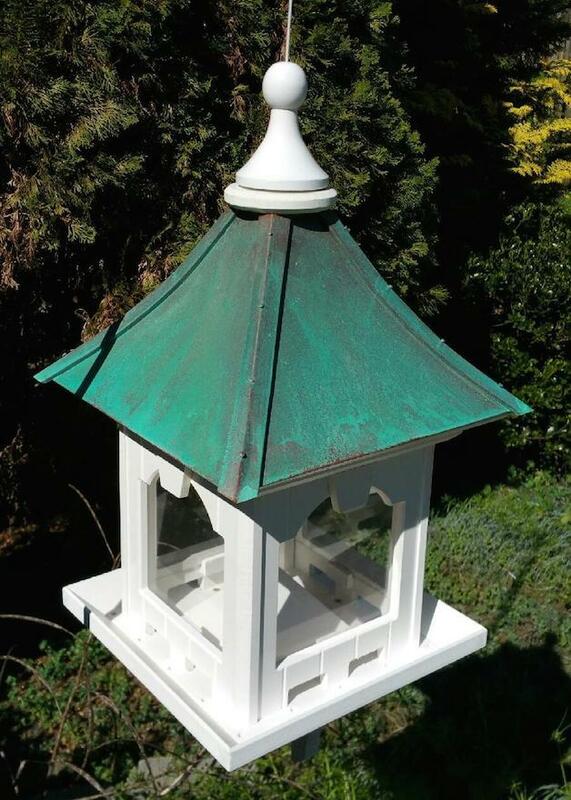 For even more of the finer architectural detail, a PVC seamless lamp post creates the ideal mount for this stunning feeder. No need for the standard 4×4 pressure treated wood post when installing with the lamp post. It’s available in a 4-inch, fluted style or 5-inch raised panel design. 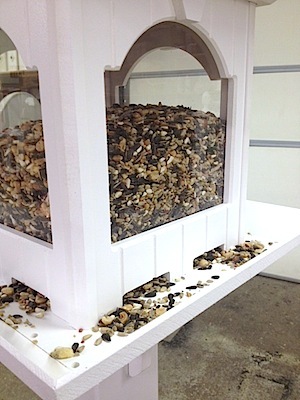 You’ll be the envy of the block with feathered friends dining in high style! 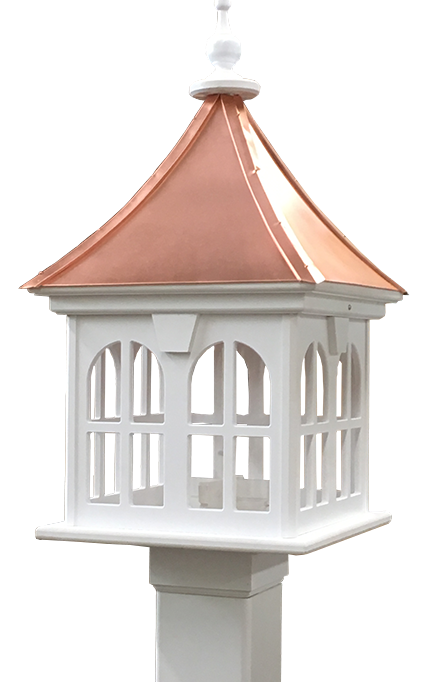 All Copper and PVC bird feeders are handcrafted in the USA and guaranteed for life. New large capacity and hanging styles too! It’s a Spring Thing… rebirth, new growth and spring cleaning. While setting out a few new Boston ferns on the porch, the old ones lingered as winter shelter for birds. Upon inspection prior to tossing the plants, a nest with 5 tiny eggs. Hark… a Carolina wren decided to take up residence and rear her little ones in this not so decorative birdhouse. 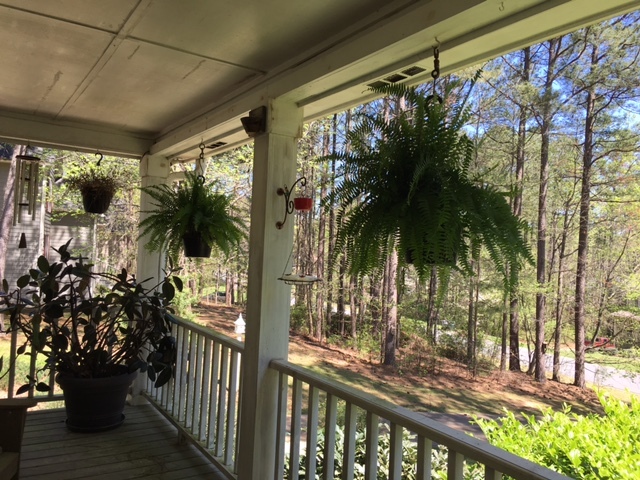 Rather unsightly after enduring through winter, the fern was moved a few feet to the end of the porch. Would she find it and continue to brood? Since most birds are pretty smart, chances were strong. 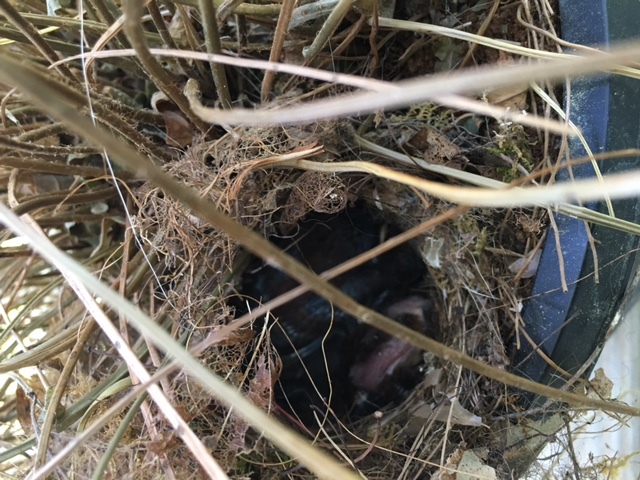 Because Carolina wrens are known to nest in the craziest places, it’s a good idea (and highly recommended) to check old outdoor potted plants before tossing. Knick-nacks on the porch like baskets pots or vases should be checked for nest activity prior to cleaning, moving or discarding them as these sweet songbirds seem to prefer a closeness to their hosts. Fretting and watching for signs of mama, the plant was inspected a few days later to find the babies had hatched… success! Now it’s only a matter of days before the not so decorative birds’ home can be discarded. Not all birds use houses, and because nests are highly camouflaged in trees and shrubs, it’s a good idea to hold off pruning and major spring clean-up until fall. Offering safe places to nest for those who are cavity dwellers helps species thrive.Wooden bird houses are always a good bet, as are vinyl and ceramic. Metal is questionable as afternoon sun could bake nestlings if not protected by shade. Ventilation and drainage are important factors in keeping babies dry and comfy too. Cool birdhouses like this moss and wicker number are handmade of materials birds already know, it’s perfect on the porch or any protected area for a natural yet whimsical touch. Wooden houses needn’t be boring either, just properly sized with bird-friendly features and sturdiness to raise the kids. Happy Spring!